I think after this wasted decade of war which has taken away almost every bit of dignity and pride from many Pakistanis who want to see Pakistan to progress in Industry, Science and Technology, Agriculture, Sports and other areas. For once we need to come out of sectarian and social class prejudices which were exploited by the designers of this war in Pakistan to forward their war agenda.Terrorism is a result of this mess just like economic collapse and real mess is this war itself. PTI’s March is an excellent move towards a good future and inshAllah it will be successful. Na-Pak Mercenary Army has done it again. But still the Peace March has achieved its goal of highlighting the issue in international media. Peace March Update:Congratulations all of you our peace caravan finally entered Waziristan !!!! Keep up the good work IK, PTI and all those who have joined this noble cause. May Allah protect you and give you success in your noble cause for justice and peace. I think its a real good step towards coming out of this war. This war has taken every piece of dignity and pride from many people who have any sense of justice, freedom and respect for human rights. This was never our war like that so called cold war thing was not ours. But in both cases Pakistan’s leadership presented itself as mercenaries for other countries and as a result Pakistan and its people faced worst situations of their history. Many people who wouldn’t ve normally thought about leaving the country were made to leave the country not because of the hardships but because of the shame and hopelessness of not being able to stop it. I really feel bad when so called “our” army bombs villages just because they have to please their imperialist master or some idiot in GHQ thinks that violating agreements with tribes will achieve some geo-strategic goals. For once, true liberals and people who believe in freedom, justice and self-respect should come out against these violations of human rights and this whole damn war. Pakistan was doing great in first 2-3 decades before it fully committed to the cause of serving imperialism and its military junta started to serve as mercenaries for others. Industries, Universities etc all were in good shape and in fact before this current war 90s wasn’t even that bad despite corruption. But this war has broken the backbone of the country and now even thinking about hope seems to be a delusion. Only ignorant people or people with deep rooted sectarian and social class prejudices will oppose this peace march towards Waziristan. People who are doing this march for peace and justice should continue with their great work and ignore these sectarian and social class fascists (or fake liberals) who have put us in this mess of war. Tribal areas became part of Pakistan through some agreements and it was Pakistan Army which violated these agreements. Technically tribal people have full right to demand freedom but at least they have not yet gone for this option. I pray for the safety and success for the participants of this Peace March and inshaAllah it will be a great success. PTI has scheduled a peace march to Waziristan. Waziristan has been a target of unjust and illegal drone attacks from USA (supported by Pakistani government and army) and military operations. People of the area are living in misery for last decade due to this unwanted and imported war which only serves the purpose of greedy ruling elite and their foreign masters. It is good to see that media and human rights organizations have shown their interest in joining this cause for peace and justice. Pakistani military establishment and government are trying their best to sabotage the peace march and so the peace process in order to ensure that the interests of their foreign masters remain in tact. Denying visas and issuing threat warnings are attempts to demoralize people who want to serve this cause for justice. It is a high time for all peace and justice loving people to come forward and help this peace initiative in whatever way they can. We support PTI’s Waziristan Peace March on 7th October 2012 and pray for their success and safety. 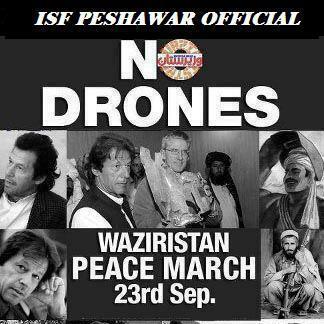 It is indeed a great effort by Pakistan Tehreek-e-Insaf to launch a Peace March to Waziristan on 23 September 2012. Imran Khan will be leading the march to show the reality of drone attacks in tribal areas and how they are resulting in innocent civilian casualties. Please support this effort by whatever way you can.